Currently visiting a representative sampling of four years of war damaged archeological sites in Syria one witnesses some fairly massive destruction some of which has been reported in the international media. But the visitor also comes upon stunning yet still relatively modest progress that many local communities are making in protecting and restoring mankind's shared global cultural heritage. Voluntary work and dedication in the midst of war and frequent mayhem. To date these measures are mainly local initiatives relying on limited community resources, with government encouragement, toughened looting laws and enforcement and facilitating local communities with repair and reconstruction permits. 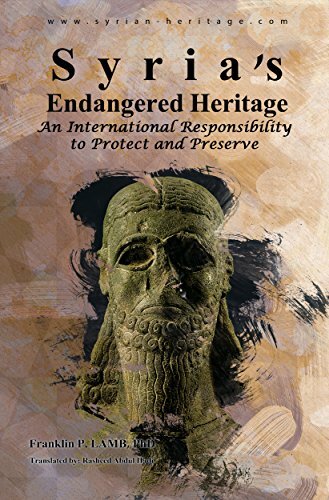 While simultaneously the Directorate of Antiquities and Museums (DGAM), of the Ministry of Culture cooperates and encourages these patriotic efforts and works with INTERPOL among others to retrieve stolen treasures. So far the local initiatives don't receive much central government cash given the many current urgent societal needs. And a paucity of foreign material assistance is arriving. But the dearth of the latter is partially offset by the expanding international interest and concern for what has been happening to archeological sites in Syria and what needs to be done urgently by way of protection and restoration. This observer has visited a number of very impressive repair and reconstruction projects now being worked on at archeological sites around Syria. Local community achievements here in Syria bring to mind the resurrection of the Phoenix with hope for salvaging and restoring our shared global heritage. Two examples are return visits by this observer the past week to archeological sites first toured nine months ago, shortly after armed gangs and looters were expelled and the sites were returned to the local community's protection. Before the current crisis there were an estimated 100,000 Christians living in the Old City. Most fled in February 2012 and as of May, 2014 approximately100 remained. One neighbor of St. Mary's informed this observer during his visit two days after rebels vacated the area on May 9, 2014 that all "Symbols related to Christianity were removed. Even from inside houses. If you had a picture of the Virgin Mary, they removed it." In neighborhoods near the old city, churches were damaged to varying degrees. The Greek Orthodox Church of Saint George was completely destroyed. Others, including the Greek Catholic Church of Our Lady of Peace, the Church of the Holy Spirit, and the Protestant church, were severely damaged. St Mary's of the Holy Belt is built over an underground church dating back to the mid first century and tradition has it that this seat of the Syriac Orthodox archbishopric contains a venerated relic which the local Bishop explain as he shoved rubble from around the altar. That relic is claimed to be a section of the waist belt of Mary, mother of Jesus. This observer was inspired by the number of parishioners and others form the neighborhood, including many Muslims one church official told me, as I watched several from the community who were covered in dust and soot cleaning out the war rubble. 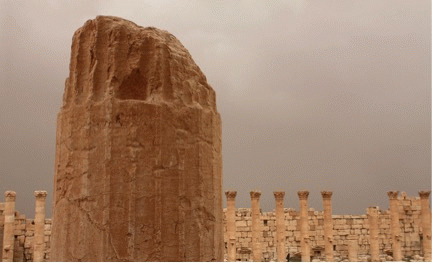 Syrians, almost without exception from my experience are deeply connected with their cultural heritage and do not distinguish all that much among its origins. Rather it appears that they are proud to help others protect and rebuild their damaged religious and cultural sites and focus more on the task of restoration of their heritage than fixing blame. Nine months ago his observer surveyed the damage to the compound with church clergy and examined the still smoldering 'bible pit" where just before their departure, armed groups built a fire of Bibles, church documents, religious icons, art works and sacramental liturgical vestments worn by Priests during Holy Communion and the performance of their religious duties. Shifting through the ashes one found the remains of stoles, manipules, dhasubles, daimatics, surplices, and choir cassocks as well as several burned crosses. Returning this week I saw that the community volunteers had recently created an excellent garden on top of the jihadists burn-pit and that locally financed major restoration work was underway. St. Mary's nave and sanctuary has been cleansed of the thick soot and the heavy smell of burned furnishings and timbers. Locals have literally retrieved pieces of priceless art from the detritus, pieced them together and re-hung them. The Parish house is being rebuilt. Less than an hour's drive to the west toward Lebanon, a trip facilitated at half a dozen checkpoints once ID was verified, and the frequently raise eyebrows and question, "What's an American doing around here?" this observer returned after nine months to the 11th century crusader castle and later Muslim fortress, Crac des Chevalier. Along with T. E. Lawrence, whose judgment I share this hilltop redoubt is the most majestic in the Middle East.